"Kalalau Rainbow" (above) is this artist's fine art Hawaiian image. It is a 20x30 inch Iris Giclée print and was honored with a Blue Ribbon award in the Aurora Colony 2001 Art Show. 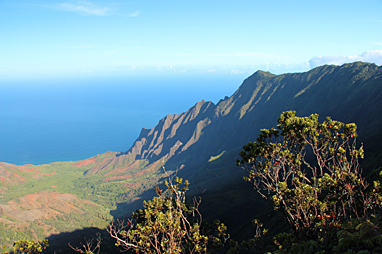 In the image, we are standing on the Kalalau Lookout and looking north at the fabled fluted cliffs of Ka'a'alahina Ridge. In the valley far below live the "Kalalau Outlaws," many of them middle-aged persons who consider their hermit-like existence in the peaceful Valley to be like an Earthly chance to re-experience the Garden of Eden. Update 2013: the largest (20x30) Giclée prints are now offered only on a Special Order basis. However, you might consider a smaller print (see below).... In any case, please enjoy viewing "Kalalau Rainbow" and my other Hawaiian images for free here on these pages! Thank you! Bruce B. Johnson. Iris Giclée prints possess an astounding depth and richness of color, and their placement upon acid-free heavyweight watercolor board radically changes their "feel" from that of a conventional photograph into the heft and feel of a painting. This artist works closely with his printers at Pearl Publishing in Portland, OR to achieve the gorgeous results possible with Iris Giclée methods and materials. Pearl's site will also provide you with an excellent discussion of Giclée and the Iris printing process. Pearl is a fully certified Iris Giclée printing provider; their phone number is 503-242-4994. 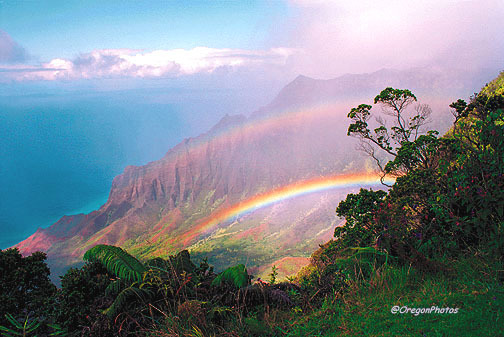 "Kalalau Rainbow" is a signed 20x30 inch (image size) special edition Giclée print. Unframed prints in this size are $200 (USD). Smaller Size "Kalalau Rainbow" Now Available! A smaller 10x15 inch (image size) special edition print is an excellent size for smaller spaces and smaller budgets. Also available are a small number of 6x10 inch, mini-size Giclée prints on watercolor board available. Please inquire if interested (see emailer below). The picture below is not for sale, but shows the Kalalau Valley in a wider view, but minus any rainbows! "Spring Thaw," "Dawn Climber," "Mt. Jefferson Sunset," and "Mt. Hood, Sandy Headwall." This Artist's Oregon Giclée titled "Spring Thaw" is shown above. Please click here now (or on the image above) to see a larger version of this image and details about it. You'll also see that we've created an inexpensive digital version for your computer screen. *Also available is Giclée print, "Mt. Hood, Sandy Headwall." Please click here to view this unusual vantage of Mt. Hood, the site of world-famous Timberline Lodge. *Also available is Giclée "Mt. Jefferson Sunset," portraying a wildly vivid sunset taken on high on the glaciers of Mt Hood, looking south to Mt. Jefferson-- sure to brighten any dark room! Click here. *Also available is the Giclée entitled "Dawn Climber," another image taken on Mt. Hood, Oregon. This image takes the familar view southward from the Timberline Lodge area and transports it to other-worldly realms. Please click here to see the image in a large format. To inquire about Fine Art Giclée Prints, please E-mail the artist via his E-mailer. (Note: additional Giclée Print subjects are in pre-press; some are based on images which were winners at the 2002, 2003 and 2004 Aurora Colony Art Shows; please inquire). Soon to come: "Smoking Crater- Mt. St. Helens." Please read this Disclaimer: although my computer monitor has been carefully calibrated to accurately display the true colors of the finished prints of "Kalalau Rainbow" and the other images on the OregonPhotos website, YOUR monitor is most likely not exactly calibated to mine and the differences in color, density, etc. may be small and of no significance, or they might be major..... If you are in doubt, it is best to communicate with me before ordering as there are ways to resolve this issue......Thank you.